Ok! I am back! Sorry it has been so long, life has been crazy. But I must remember that it is good therapy to write on the blog! What have I been up to, you may ask. Well, since the Las Vegas trip, I have been in San Francisco, Washington, DC, and Orlando for work as well as some in-state trips, and in South Dakota to be a God-parent to my newest nephew! There were some great restaurants on some of those trips, and I will share those with you over the next few days. 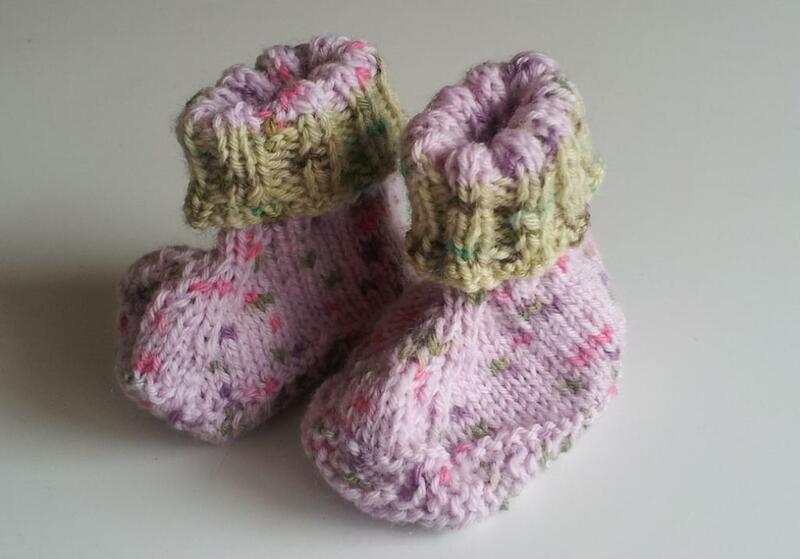 I have also been busy sewing/crocheting/knitting/crafting when I can. With two new nephews and one new niece in the last 5 months, I have been busy. I am glad to say that they each have a crocheted afghan, although I am working on another one for baby L., the youngest, in colors more suitable to her nursery. 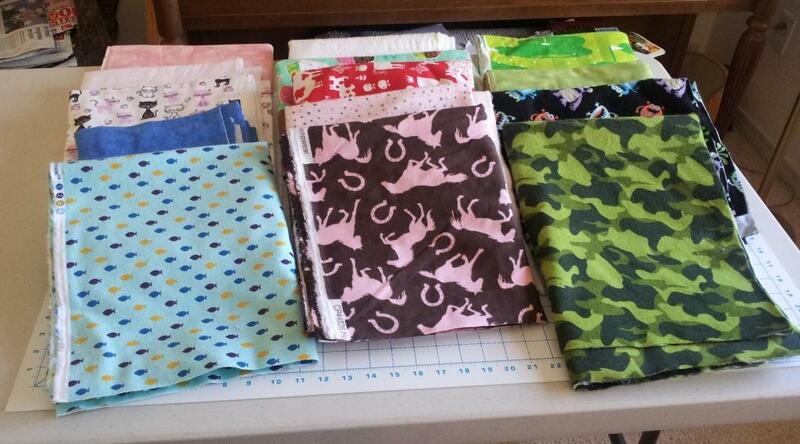 Then I will get started on the pieced quilts for each of them. I have no pictures of Nephew O’s blanket from December. Asking his mother to send me some. Sometimes when I get in a tizzy to mail things, I forget to document properly. He also got some “Magic Slippers” baby booties, but again, no picture. Nephew B received the “November” baby afghan from from the Leisure Arts booklet “A Year of Baby Afghans.” I did this one as a Camp Loopy project last summer, so you may recognize it. 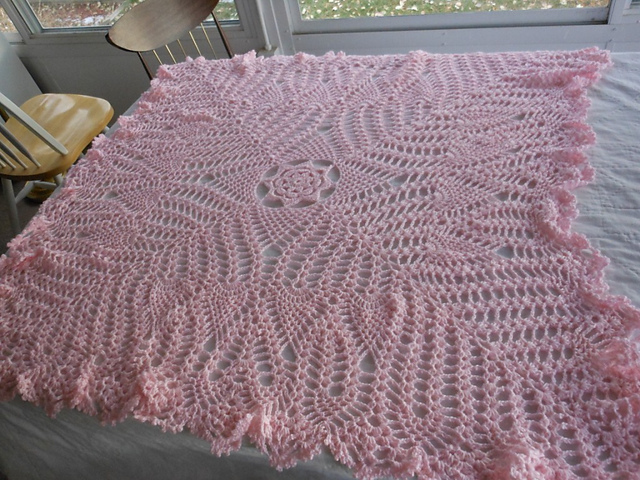 I love this afghan, it goes together very quickly, no seaming, and looks lovely. He ALSO got Magic Slippers booties, with a slight modification and addition of the ribbing/sock top which apparently makes them stay on better. “Camo” colored yarn, which was a fortuitous donation from my friend Judy, when I was looking for sock yarn for this very purpose. Baby L., born March 1, received the Heirloom Baby Blanket (Coats and Clark, free pattern) – this is the one that nearly drove me crazy. All kinds of errata, but none of it on the original pattern page. You have to dig around Ravelry to find it. Beautiful afghan, though. And she gets a one-of-a-kind because I am never doing THAT again. Plus, that one really isn’t in her nursery colors, so I am working on another one for her. That is the bonus she gets for being the only girl in the latest batch of babies! 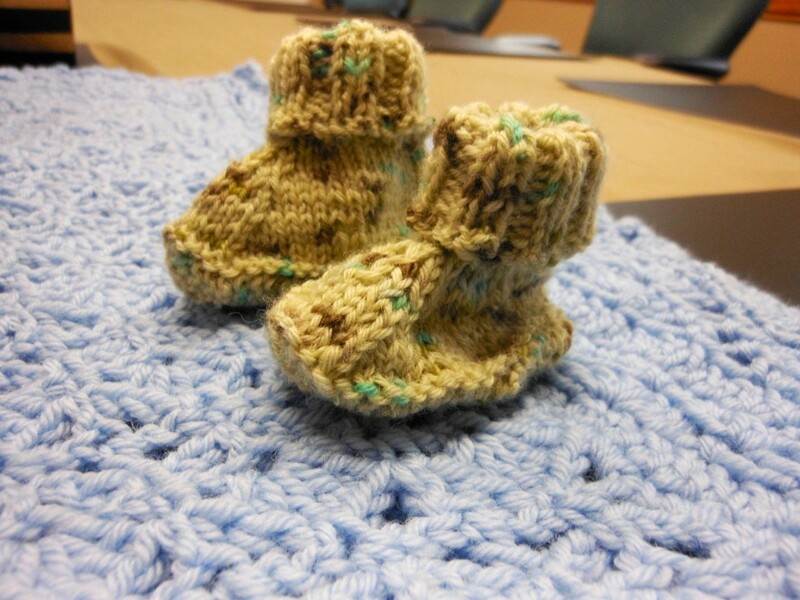 And…other than wrapping up baby afghans and mailing them off, what else have I been doing? 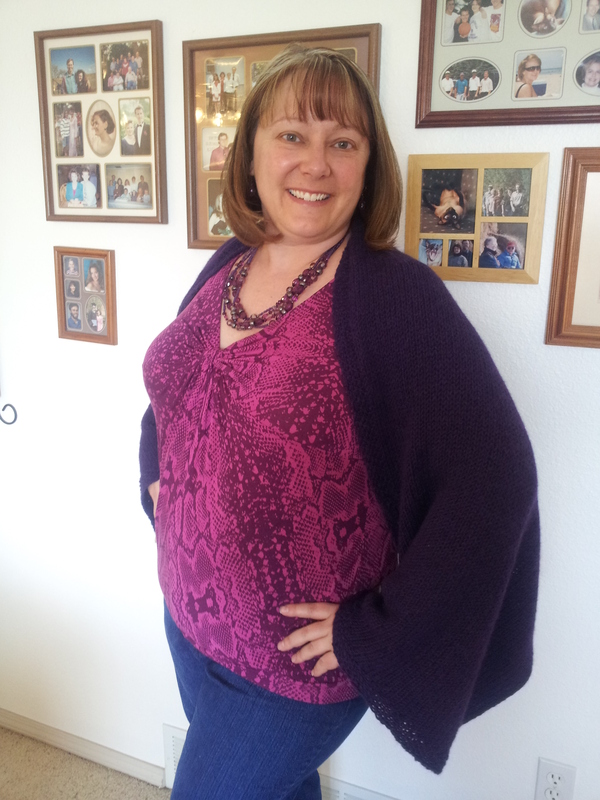 I FINALLY finished the #359 Nancy One Skein Shrugigan by Lisa Limber, which I believe I started in June 2010. This was a good airplane knit, but then I ran out of yarn, and had to search for yarn in the same dye lot (after tearing my studio apart, of course, being certain I had purchased enough) (apparently I hadn’t). I made it a bit longer than the pattern suggested, and with a different yarn, so that was probably the problem. I LOVE how it turned out, I have worn it several times already, and get compliments on it. And knitting and crocheting isn’t all there is to life, right? So JoAnn Fabric had a small flannel sale. These are all destined to be made into Auntie G.’s famous receiving blankets. Some of this has already been made into receiving blankets. I was VERY excited to find the camouflage flannel, and then proceeded to buy a bolt of it at the next store (that was all that I could find within a reasonable radius….) And I was just looking for fish flannel this morning, and I see I have some right there. BONUS! I decided to do some further color work, and make some mug rugs, foundation strip-piecing. 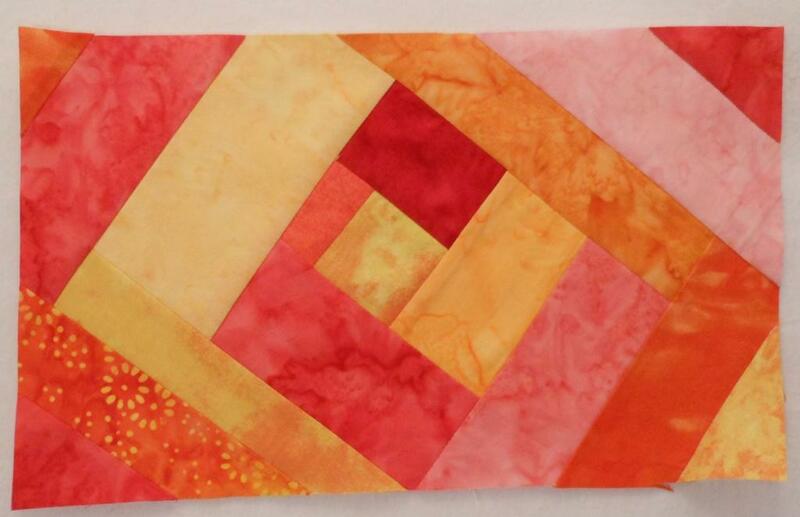 I like how the red/orange one turned out (not quilted yet, though.) I call this one Mango Salsa. I am also making a brown/white/green one which is supposed to be called “Chocolate Mint,” and already I don’t like it as much as this one. Still in progress, no picture yet. Andddddd…. last but not least, I always have a pair of crochet potholders going. I was working on one when we went to see the Lady Jackrabbits play in the Division I Tournament in Boulder. 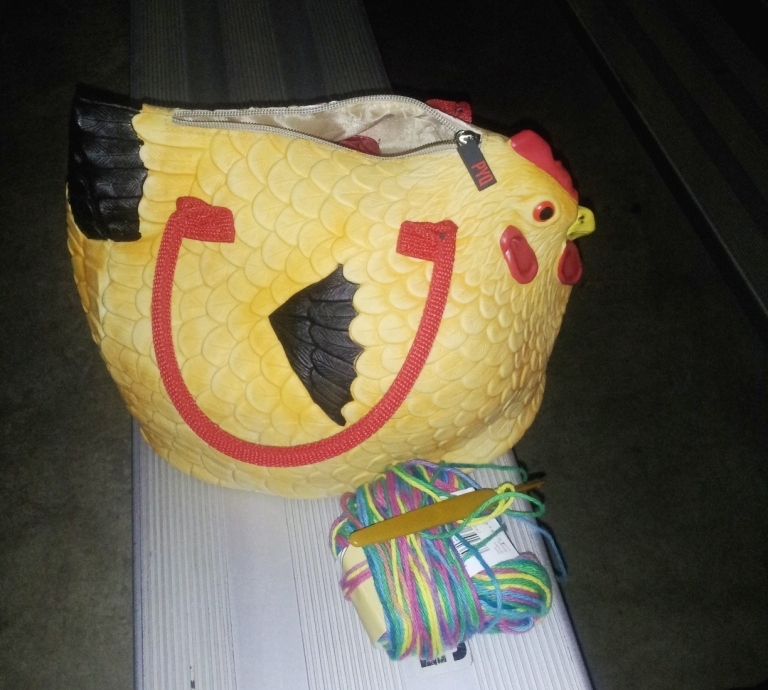 The chicken purse approves. Let me tell you, you could smuggle things into places in the chicken purse, because the chicken purse flummoxes the security guys. They were pretty much stunned. 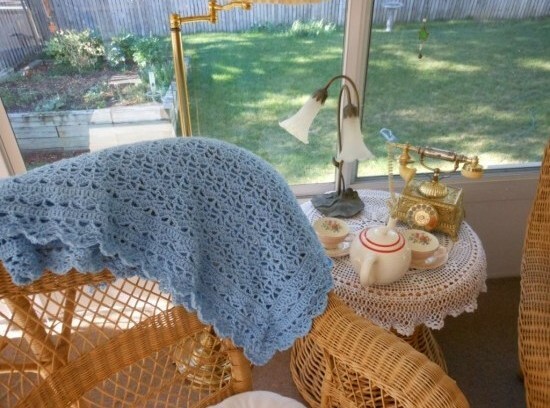 This entry was posted in Crafting, Crocheting, Family, Kitsch, Knitting, My Idea of Fashion, Nieces and nephews, Quilting and tagged crochet, knitting, quilting by glenderella. Bookmark the permalink. I think the chicken purse flummoxes everyone. Glad to see you’re back! The chicken purse is. The chicken is zen. The chicken purse also causes me to get into conversations with clerks at the checkout and forget to take my bags, wallet, phone, etc. The chicken is all powerful. The pink afghan actually matches her room quite well. 🙂 But we are certainly accepting additional ones! Oh, wow! Maybe one day I’ll learn a useful skill like knitting or crocheting. Someone taught me to knit, but not to purl. I learned how to knit when I was a kid, but didn’t learn how to pearl until about 5 years ago. It’s never too late! How about Taylor’s pillow cases? Didn’t take a picture of them yet – I made another set just like them for the Bazaar, so I will do that tonight! Glad you are back I for one have missed your blog. Chicken purse is hilarious. Too cute. I want one. You, too, can have a rubber chicken purse that stops people in their tracks! And then they point at you and say “Chicken Purse”! We are a group of volunteers annd starting a new scheme in our community.